You don’t like a court decision, you appeal to a higher court. That’s the proper course of action. Simple as that. This was a bonehead move by Ford and anyone who supports it is a bonehead. Argunents are being made tomorrow to get a stay of Belobaba’s ruling. And if the Appeals court rules in the Ford governments favour which they should given Belobaba’s errors in his ruling, Ford will have proven to be 100% justified in invoking the Notwithstanding Clause for exactly it’s intended purpose – to challange judicial over-reach. No, he will have been shown to have acted precipitously. If he gets the stay, the sturm und drang brought on by s. 33 will have been completely unnecessary. 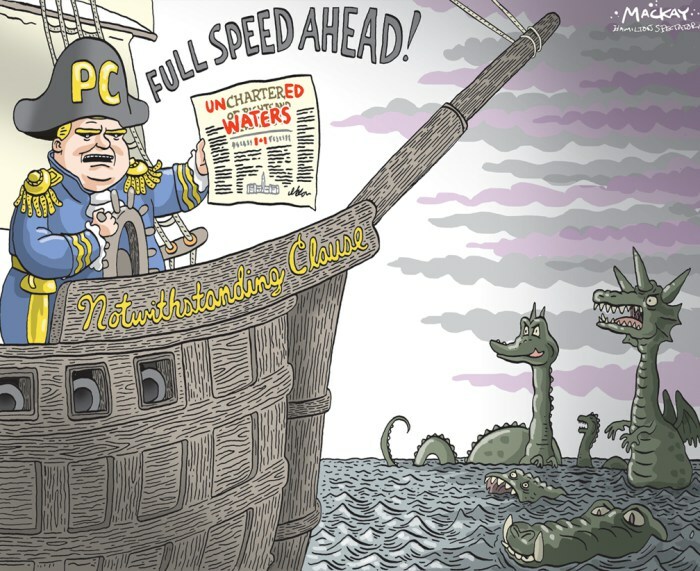 And without drama Ford could have taught all Canadians that not interfering in an ongoing election is not protected by the Charter. Well, if he mentioned it on the campaign trail, all of this could probably have been avoided. Oh, Warren. Did you not know “sturm und drang” is the motto on the Ford family crest or maybe it’s “strum and dang.” Hard to tell anymore. Four more years of this huh. I agree in part, who cares what the size of Toronto’s council is, especially if you live outside of Toronto. Where I disagree is that he has acted like a petulant child who didn’t get his way and demonstrated that he will ignore court decisions that he disagrees with. Winning the appeal which most of the media believe will happen will unfortunately be too late to hide the fact that our premier things that he is above the law. He thinks he’s above the law by using the tools the law explicitly provides to him. And again, it has nothing to do with not liking the decision. Belobaba made significant errors in his ruling including ignoring three SCC decisions. Paragraph 1 is bang on. And I don’t have to like it. But that changes nothing. The speaker ruled that the notwithstanding clause is different enough. In modern illiberal democracies, like Hungary and Turkey, people have thier “democratic rights” , but nationalism is promoted endlessly and the media and courts manipulated to ensure the dominance of the ruling party. That is the kind of thing that is possible through the notwithstanding clause. I think the City has a case to ask the SC for a ruling on the use of S.33. it seems to meet does not fit the expectation for use of that clause and the SC may need to put down some markers for future abusers. Remember the Quebec Reference and what percentage of the vote was required for secession to be legal? SCC cop-out: left to the political actors. This will be a cop-out redux. I still think the application of Charter rights to the issue was a hell of a stretch by the judge. I mean it’s been explained but it still doesn’t make sense. If the rights of citizens are being infringed because the ridings are being made larger, does that imply that all other ridings which serve a larger population than the ones in Toronto are unconstitutional? Ford is a moron. He may not be an effing moron like Trump, but he is nonetheless a moron. So, how about having a sense of proportion. Should Ford in the future use the NWC to, say, muzzle news organizations that are critical of him, well that would be a really good time to man the barricades. But using the NWC to implement a bill that, at most, has timing issues is not that time. So, accept the inevitable and wait for when the Premier does something remarkably wrong and/or stupid that has real consequences – it’s not likely to be a long wait. The Premier is appointed by the Lt. Governor and must maintain the confidence of Provincial Parliament to remain in the job. I raise my hand – this confederation needs a revised constitution. Damage is being done to the ties that bind this country because of its massive deficiencies. Who knows how much longer it can remain together if it isn’t reformed. Seems to me that Doug Ford hasn’t actually done any of that. His political enemies (the Liberals and NDP ) have. They are the ones making a big deal of this and bringing up the Constitution over and over, not Ford. If they don’t like it, they should just stop, right? After Mike Harris forced amalgamation on Toronto in 1998, the Progressive Conservatives were shut out of the city for 20 years. Now Torontonians have given the party another chance, and it is again attacking their municipal government. I wholeheartedly disagree with this premise that the Constitution is a “beast”. If that is true than there IS something wrong with this country. But there is. And it’s not the Constitution! The Constitution belongs to the people! When judges take what the people wrote and what the people meant and remake it in their own image, judges become the supreme law of the land. This recent ruling is an example of that. Thankfully we have the NWC to deal with exactly this. There is no need to seek even more judges to declare what is obvious: that the people democratically elected Mr. Ford to repair the province and reduction of city council(s) etc. needs to happen.